The Doctor may not have a home to call his own outside of the TARDIS but in yours you can now bring some of the Doctor Who magic inside it with these fantastic home accessories which are top quality and are impeccably designed. Essential items for your Whovian dinner parties or coffee mornings and you can choose from a Boxed Mug Set (Available In Four Designs and Packaged In A Unique Tardis Box, The Mugs Feature Striking Graphic Prints Depicting The Tardis, A Dalek and A Cyberman On Bold Colour Backgrounds, Premium Stoneware Mugs, Dishwasher Safe), an Espresso Cups Set (x4 cups, Each Mini Cup Features A Doctor Who Icon Such As The Tardis, A Dalek and A Cyberman On A Bold Colour Background), a TARDIS Teapot (a beautiful Porcelain Teapot featuring the iconic Tardis. They come in their own unique Tardis Presentation Box, dishwasher safe), a Dalek Teapot (This beautiful Porcelain Teapot features a Dalek on orange background. It comes in its own unique Tardis Presentation Box, Premium Stoneware), a Cyberman Jug (This Cyberman 1litre Stoneware Jug is packaged in a unique Tardis Giftbox, Size 100mm X 188mm X 161mm. 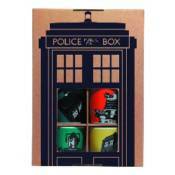 Premium Stoneware) or a TARDIS Milk Jug (Complete your Doctor Who Home Set with a Creamer Jug With Tardis Design.,Premium Stoneware).